VANCOUVER, BC – R&B Brewing has announced the release of a new beer created in collaboration with Joe Leary and Rick Mohabir, hosts of the Just Here For The Beer radio show on TSN 1040. 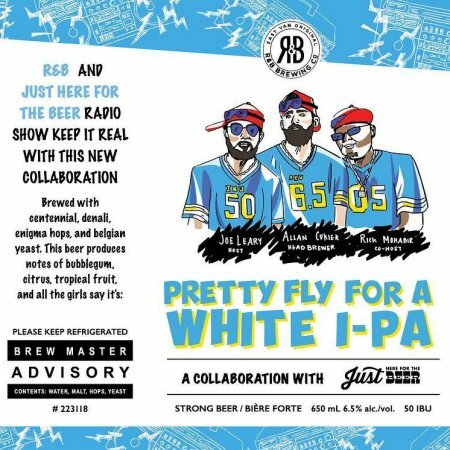 Pretty Fly for a White I-PA (6.5% abv, 50 IBU) is the latest in a series of collaborations between JHFTB and local breweries, all of them featuring music-related puns as names. Pretty Fly for a White I-PA is a fun blend of the old and new worlds. A style hybrid between a Belgian Witbier and an IPA and this version is brewed with a Belgian yeast strain, orange peel and hopped with fruity “new world” hops ; Centennial, Denali and Enigma. Pretty Fly is available in 650 ml bottles and growlers at R&B, in bottles at private liquor stores, and on tap at select local establishments while supplies last.